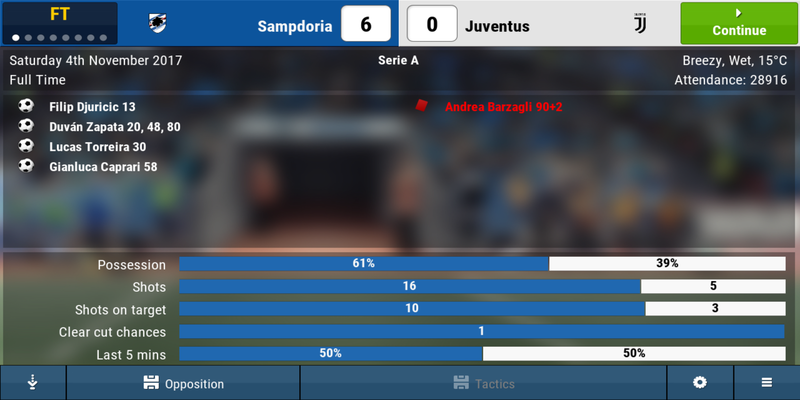 How can I possibly beat the formidable Juventus 6-0 using the tactics a League 2 or Conference team would use when playing a Premier League team? My Sampdoria side are average. I deactivated budgets in transfer window so I didn't have a penny to spend at the start of the season. It's not like my side have the skills needed to make these tactics work so well i.e. dribbling and shooting. What player roles are you using? Maybe your just a tactical genius? I don't think a slow, uber defensive, long ball game would make me a tactical genius. It is the easiest tactic to defend against. The thing is, I'm not countering. I'm playing a contained strategy which (from what I recall in previous versions of FM) is a strategy where the players don't look to attack, preferring to keep possession of the ball and not doing anything risky that could result in the opposition scoring. Yet I am the leagues top scoring side which contradicts that mentality. Surely a world class side such as Juventus would cope with these primitive tactics. I'm surprised - but I'd need the save to investigate further ... any chances of obtaining it? I'm now into my second season and three of those players have moved on. Will the save still be of any use? I should have taken a copy of my save for reference for reference. Apologies. It'll be harder that far from the situation - but presuming you're using similar tactics etc. it'll still be a huge help, thanks. Save file sent. Thanks for taking a look at it. Thanks - I've got it here, I had a party last night so won't look at it until Monday I'm afraid (in all honesty I won't be doing much apart from watching the Final and playing soccer today ... anything intellectually taxing is out). I'd like to share an observation I have about this Sampdoria career I'm playing. As you know, I've played this game quite extensively for quite sometime and I have been pretty brutal comprehensive with my feedback. So I like to think I have a pretty good idea of how the game works from a user/gamer perspective. 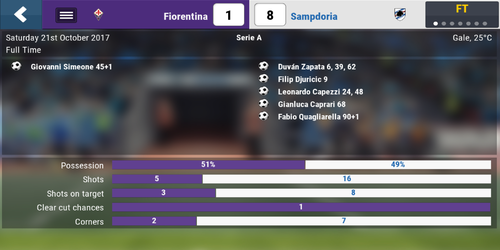 The number of goals scored, the winning margin of some of my victories (how many goals I've won by), and the success I've been able to achieve through the use of these really negative tactics has definitely made the game "iffy" (I eventually finished 2nd in Serie A). 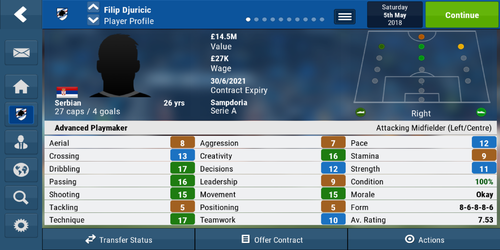 But I am now on my third season and decided to change my tactics. Bizarrely, playing a formation and strategy that would better suit my very talented squad (most players have a rating of at least 4 stars out of 5) has made the match results really, really random. I'm using tactics that I have used many times before yet the results are just so unpredictable. I can beat teams by scorelines such as 5-3, 4-1, 7-0 but then lose to teams 6-4 (and this isn't losing to top of the table teams - I'm talking about losing heavily to teams who are lower than mid-table or fighting relegation). It has become so bizarre. The amount of goals involved in a game averages at a staggering 4.2 goals per match and this isn't down to my very attacking tactics. I tend to play with a counter or control strategy now. So having thought about all the things I've done differently in this career from previous careers, the only thing that has changed is how I watch the enhanced match highlights. I now watch matches with the options of Pitch / Key / Fast as opposed to my usual Pitch / Extended / Fast. Now I'm sure you're going to tell me that the match highlights have no bearing on the results. What probably changes the results is how many tactical changes are made based on how much of the match you see. But it does seem odd that having played FMM on the extended option for so long, and being used to a certain amount of goals per game, the fact that I have now changed the highlights to 'Key' has seemed to dramatically alter the outcome of games. This seems super unlikely (verging on impossible) however we will be able to add some checks internally that should hopefully be able to prove that this has no impact. If we can't prove that I will be extremely surprised!